OWINGS MILLS, Md. — Joe Flacco, wearing a white Ravens T-shirt and black gym shorts, lingered outside the training room one recent morning. He was bored. He’d just finished a rehabilitation session on the back injury that has sidelined him for all of training camp. Outside on the field, his teammates still had 30 or so minutes left of work to do. Who knew a 10-year veteran could have such a longing for a training-camp practice? 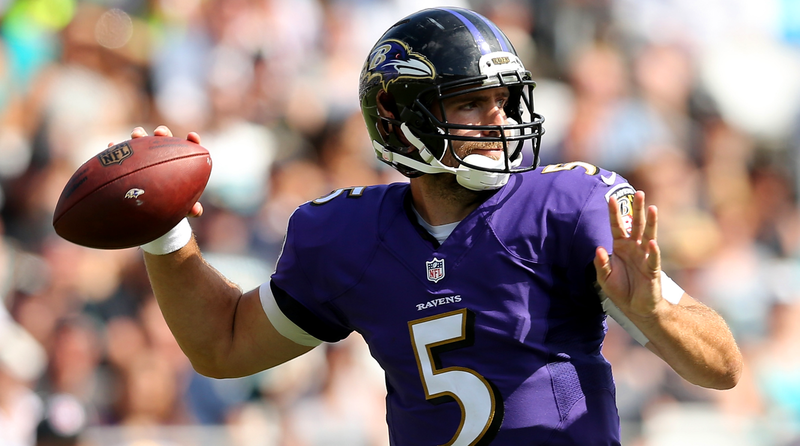 Translation: Flacco plans to be ready for Week 1, when the Ravens open their season in Cincinnati. And they need him to be, not just because the only other quarterback on the roster with any game experience, Ryan Mallett, has had plenty of ups and downs in the first two weeks of camp. The Ravens have, yet again, been snakebitten by injuries: Seven players are already out for the season, including tight end Dennis Pitta, who dislocated his hip for the third time in June; Kenneth Dixon, the second-year running back with a kick to his runs; starting left guard Alex Lewis; and Crockett Gillmore, Pitta’s replacement. They lost two others to retirement or suspension. No wonder that, earlier this week, coach John Harbaugh bristled at any and all injury-related questions. Baltimore Ravens quarterback Joe Flacco. It’s an interesting time in Baltimore, and not only because owner Steve Bisciotti crowd-sourced the team’s decision-making on whether or not to sign Colin Kaepernick while Flacco has been sidelined. The Ravens, perennial postseason contenders for most of this century, have missed the playoffs two years running. The last time they went more than two seasons in a row without a playoff game was back during the organization’s first four years in Baltimore. The roster is already operating at a deficit before the season starts, while at the same time, the pressure to return the club to its winning ways is building. It’s a far cry from where things were just five years ago, the season the Ravens won the franchise’s second Super Bowl since the team came to Charm City, in 1996—but that’s how this business works. Flacco and Harbaugh, in their first five seasons together, made the playoffs five straight years and won nine playoff games, culminating in Super Bowl XLVII. Since then, they’ve missed the playoffs in three of the past four seasons. Flacco was on his relatively cheap rookie deal for those first five years, a boon for team-building purposes, but there’s certainly more to the story than just the salary cap. The Super Bowl year was the last season with defensive leaders Ray Lewis and Ed Reed. The club has also had some high draft misses: Their first and second-round picks in 2013, Matt Elam and Arthur Brown, are no longer with the team, and Breshad Perriman, a first-round pick in 2015, missed his entire rookie season and has been nursing a hamstring injury. Oh, and the one reason players and coaches are conditioned not to offer as an excuse: injuries. Asked about the differences between the contender teams of the past and those that missed the postseason entirely, Harbaugh said he didn’t want to entertain such a comparison. “I just don’t think it’s that dramatic [of a difference],” he said. That’s not necessarily incorrect. In 2014, the lone season they’ve made the playoffs since their last Super Bowl ring, the Ravens gave the Patriots a run for their money in a divisional round game in Foxborough. Last season, they went into Week 16 able to win the division by winning their final two games. Instead, they lost a tight game to the Steelers—one of six losses in 2016 that were decided by one score or fewer. But however fine the line between playoffs and not might be, it’s a hard line, and one that Flacco hopes his young teammates don’t get used to being on the wrong side of. With the so-called “monkey on our back,” the Ravens head into the 2017 season with a starting quarterback who has a back injury; less multiple offensive weapons; and a pass rush tied heavily to a 34-year-old who has torn his Achilles twice. The Ravens’ interest in Kaepernick went only so far as sending out a trial balloon to see how the community—namely, suite holders and sponsors—would react to the organization considering the quarterback who protested the treatment of African-Americans in the U.S. by kneeling during the national anthem last season. But if there were major concerns that Flacco would miss significant time, it figures that the Ravens would have made another move at quarterback, whether it be Kaepernick or otherwise. Flacco sought a second opinion on his back more than a week ago and the results confirmed the current plan of action: Rest and rehab, before easing back onto the field later this preseason (it makes sense that he’d try giving his back a break from the rotation of the throwing motion). Of course, back injuries can sometimes be unpredictable. Before Flacco’s back issue popped up on the eve of camp, Weddle said Flacco looked 10 times better than he did all of last season; stronger, and with no hiccup in his drop-backs, more than a year out from the ACL injury he suffered in November 2015. That was the year Ravens injuries reached critical mass and the team stumbled to 5-11. The inauspicious run of injuries this summer has started to feel a lot like 2015. But Flacco is determined to be back when the season starts, and he and his teammates are well aware that no one in the team headquarters located on Winning Drive is happy with the results over the last few years.